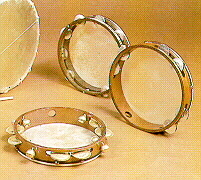 Small tunable bowl drums, 8" diameter hand-hammered copper bowls, with calfskin heads, twelve leather tuning thongs, and pair of wooden sticks included. Small double-headed drums, walnut frame; two rope-tensioned calfskin heads with sixteen leather tuning thongs, single adjustable gut snare, one wooden stick included. May be hung from the wrist and used with the smaller sizes of tabor pipes or independently. 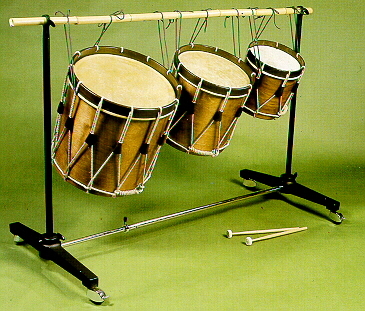 Single-headed drums of equal diameter and length, with genuine walnut frames and head rims, one or two rope-tensioned calfskin heads, and sliding leather tuning thongs. These instruments produce a well-defined pitch and may also be used in sets of two or three as renaissance timpani. These single-headed drums stack inside one another for easy storage and transport. 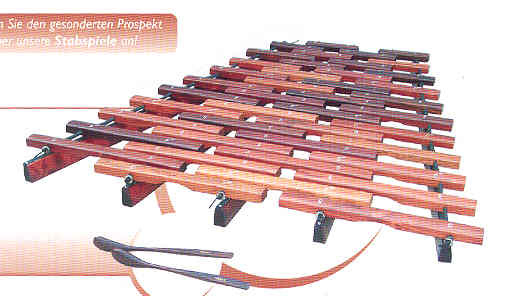 Early form of xylophone, with forty-two palisander tone bars in four rows over a wooden slat frame; fully chromatic range of over three octaves (f-c''''); one pair of spoon-shaped beaters included. Copyright, Antique Sound Workshop, Ltd., 2019. All rights reserved.